The frigid temperatures and icy landscape of winter are fading from view, and spring is just on the horizon. Spring floral arrangements are the perfect way to celebrate the season. Whether for decorating your place of worship with brightly colored petals for Easter or showing off some greenery for St. Patrick's Day, anyone can enjoy the beautiful blossoms of season. 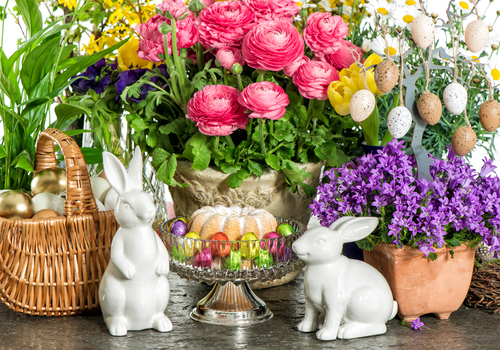 Here’s how you can celebrate with spring flowers. Floral centerpieces, whether in the home, school offices, or church foyers bring a bright, warm atmosphere to every area they touch. Their sweet scent permeates their vicinity and provides a welcoming focal point for guests. In addition, studies have shown that fresh flowers put people in better moods, meaning you’re spreading cheer just by placing an arrangement in an area where visitors can enjoy them. From fun and festive St. Patty’s Day shamrocks to delicate roses for a special someone, there are so many occasions to give the gift of fresh flowers this spring. Floral arrangements have become akin to handwritten letters; they show your loved one that you care and were thinking about them. Many floral shops also allow you to customize your arrangement in any way you choose, so the special person in your life will receive a unique gift reflecting of your love, support, or sympathy. Floral decorations and bridal bouquets are things people remember most about weddings even long after the church bells have stopped ringing. They’re a beautiful addition to any event, and many flowers are suited for different occasions. For example, bright roses, peonies, and tulips are great for a church altar arrangement for Easter. On the other hand, spring lilies are the traditional flower of choice for more solemn occasions such as funerals or celebrations of life. The best floral arrangements are always in your local community, which is why you should choose Roaring Oaks Florist in Litchfield Hills, CT, to purchase flowers for every occasion. From the area’s boarding schools like Kent and Hotchkiss School to local churches, Roaring Oaks provides their community with the freshest flowers without any synthetic dyes or perfumes. Their close attention to detail, quality, and commitment to customer satisfaction keeps customers returning for all their needs. For more information on their available bouquets and floral delivery, visit them online or call (860) 364-5380 to pre-order today.